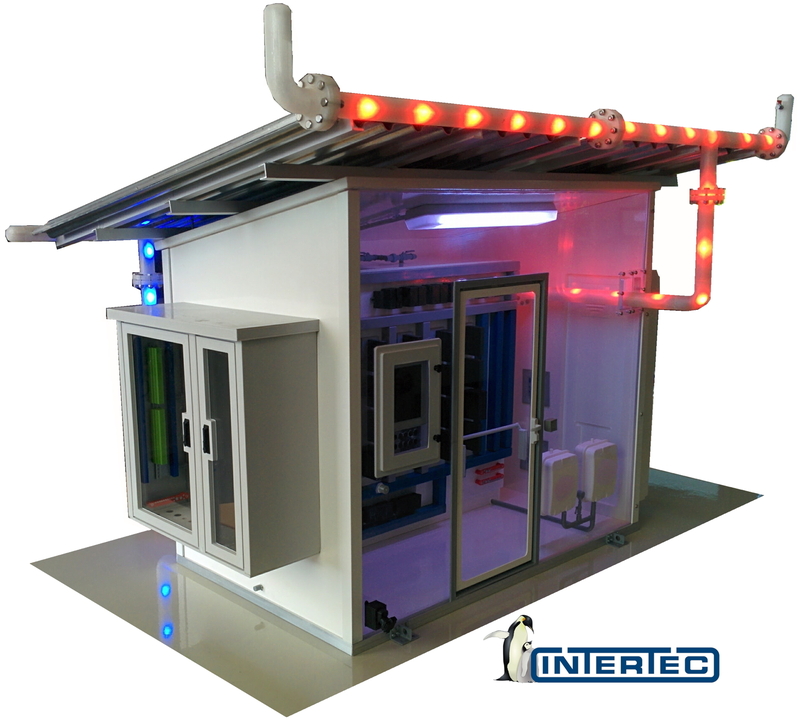 Cairo, Egypt, 12 February 2018 --- Intertec is demonstrating a highly unusual equipment shelter at EGYPS (the Egypt Petroleum Show). Its outdoor PERI SHELTER for protecting field-instrumentation and automation makes all the system components that are required for normal operation accessible via the exterior of the building. This 'inside out' design approach can dramatically reduce shelter sizes, and greatly simplify construction and installation. Among many design problems and costs that can be avoided are the need to make plant buildings blast proof and fire resistant because personnel might be inside, major reductions in size by eliminating desks, control panels, door opening spaces, aisles/walkways/escape routes etc, and much simpler internal atmospheric control requirements. Intertec's PERI SHELTER meets a growing problem faced on automation projects. Automation systems are becoming more complex, due in large part to ever more sophisticated safety technology. Adding such equipment into already crowded plant areas - often close to the process in hazardous areas - has become a major challenge. And the problems that result can contribute significantly to project cost overruns, a situation that some industry insiders describe as a crisis. This new outdoor shelter concept has just been proved by Intertec on a current refinery upgrade project in the Middle East. Eight PERI SHELTERS are being used to house new PLC-based control and safety systems for a refinery's burner systems. Panel-mounting enclosures on the exterior provide access to electrical connection and I/O termination points, and cooling systems. A touchscreen HMI panel that sits on an external wall allows operators on the ground to monitor the PLC or make adjustments to control programs locally via an inspection door. The shelters also feature a novel fault tolerant cooling system that is ideal for Middle East locations, based on a combination of passive and active cooling. Passive cooling is extremely reliable and operates independently of an electrical power supply - ensuring that the shelters remain cool even during a power outage. An additional powered water cooler improves the efficiency of the cooling system. A third air cooler provides an independent back up. "PERI SHELTERS can cut project costs by millions of dollars, and cut months off of project timescales" says Intertec's Director for the GCC region, Rohit Nath. 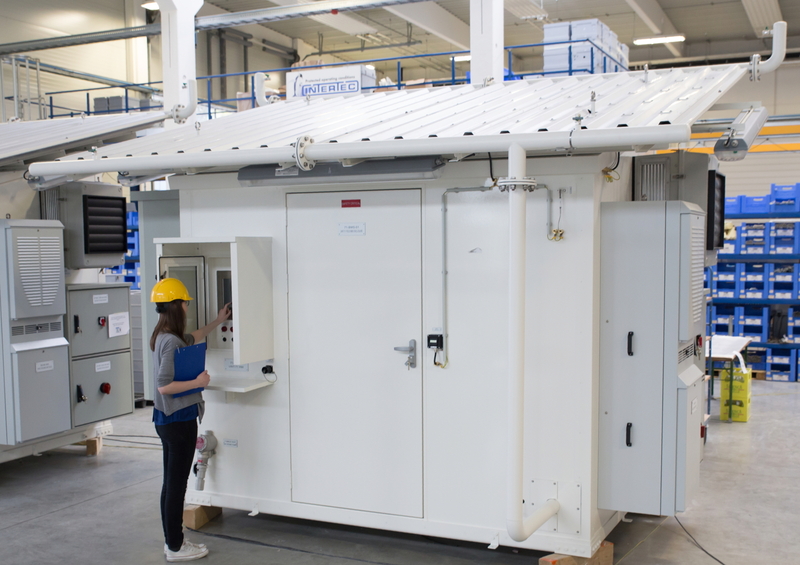 "For turnaround projects in existing plants, the unmanned shelters avoid the need to install larger and expensive manned buildings such as satellite instrument houses or remote instrument enclosures. They fit easily in crowded spaces, close to the process in hazardous areas. And, with the benefit of Intertec's unique hybrid cooling technology, they are also ideal for SCADA applications in remote locations and on pipelines." At EGYPS, Intertec will show a new style of outdoor equipment shelter that can reduce project costs and timescales dramatically by means of a radical 'inside out' design technique. At EGYPS, Intertec is demonstrating a new concept in outdoor equipment shelters using a model which shows the space saving 'inside out' construction, and lighting effects to demonstrate passive cooling.